Climate change is threatening several of California’s most valuable crops. Recent studies suggest that warmer temperatures, and the associated reduced winter chilling period, could render California’s climate unsuitable for growing a variety of fruits and nuts. Insufficient winter ‘chill hours,’ defined as the cumulative number of hours below 45 degrees Fahrenheit, can disrupt pollination, delay flowering, lower yield, and reduce fruit quality. 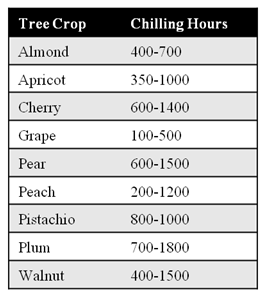 California orchards are predicted to experience less than 500 chill hours per winter by the end of the 21st century, which will impacts the yields of walnuts, pistachios, apples, pears, and stone fruits like cherries, apricots, nectarines, peaches, and plums. For several years, researchers have pointed to California cherries as particularly vulnerable to warming winters, with yields expected to decrease 20 percent by the year 2050. The USDA recently reported that the 2014 nationwide cherry production was 2 percent lower than in 2013, while California’s statewide cherry production was down 63 percent compared to 2013 yields. The USDA attributed California’s cherry crop failures primarily to lower winter chill hours. We spoke with Al Courchesne of Frog Hollow Farm, who agrees that the warmer winter and reduced chill hours had negative effects on his cherries this year. Farmer Al gave positive reviews of his other stone fruits, however, and reported a record apricot crop. Carl Rosato of Woodleaf Farm also reported issues with his cherries, although his apples, peaches, and pears emerged unscathed from this year’s warm winter. He noted that the cherries did not get brown rot; rather, they withered during bloom. This contributed to his speculation that other climatic forces, such as high humidity or wind, may have disrupted his cherries this year. If reduced chilling hours were entirely to blame, growers might have experienced issues with other high-chill tree crops, too. Too Much Warmth or Too Little Water? USDA meteorologist Eric Luebehusen suggests that these numbers reflect three consecutive years of dryness beginning to manifest themselves. Carl isn’t convinced that the drought or reduced winter chill hours are entirely to blame for substandard yields. On Woodleaf Farm, he explained, the biggest issue is the unpredictability of cold spikes in the spring. Erratic spring weather caused serious frost issues during seven of the past ten years on Carl’s farm, which led him to install a blanketing system over his orchards for frost protection. Research suggests that California growers develop new tree cultivars with reduced chilling requirements and establish management practices to cope with insufficient winter chill. Many growers are engaged in low-chill cultivar development on their own farms. Farmer Al has eliminated most stone fruit varieties with high winter chill requirements. 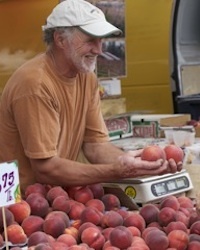 Carl uses reduced-chill cultivars and also breeds his own peaches. However, there are some concerns with breeding low-chill fruit, namely that high-chill varieties maintain a quality and taste unique to California-grown fruits. Additionally, developing new cultivars can require expensive and long-term research. Suggested management changes involve manipulating irrigation, planting density, and shading to reduce orchard temperature, as well as implementing agrochemicals to manage tree dormancy. As we noted in a previous blog, these adaptation techniques are resource and energy intensive. 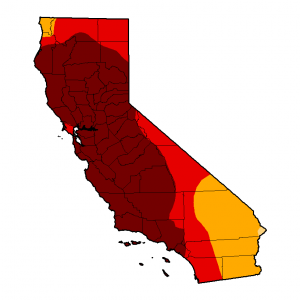 While these strategies can surely buffer growers against reduced winter chill, it is important to note that a plethora of climate change impacts threaten California farms. This is why diversification is a crucial component of increasing resiliency against climate change. Both Carl and Farmer Al blunted the impact of a potentially devastating cherry loss this year by cultivating a variety of additional crops. Whether the culprit was the drought, reduced winter chill, high humidity, or cold spikes in the spring, diversified farms have the capacity to bounce back from a crop failure by depending on other crops. Climate change-related research is crucial for sustainable agricultural development. There are two upcoming opportunities for you to give feedback on how the State of California plans its climate research agenda for agriculture over the next several years. (2) The State of California has also released a draft of its Climate Research Plan, which seeks to address a large set of climate-related issues, including ways to reduce greenhouse gas emissions and strategies for building resiliency. 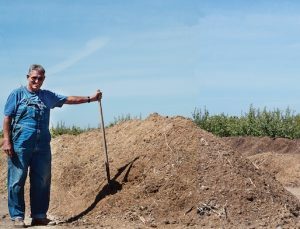 The draft plan proposes further research on the climate benefits of building soil organic matter, compost applications on rangelands, and more. Written comments on the draft Research Plan are due by September 8th.